Stranger Things has to be among the biggest successes for Netflix's ongoing efforts to flood the media universe with original content, and in advance of production beginning on the show's third season next month, The Hollywood Reporter says that the cast are all getting some pretty big bumps in pay. The biggest, proportionally speaking, is going to the core cast of child actors, who are reportedly making as much as $250,000 an episode, about 12 times what they made in the first two seasons of the show. 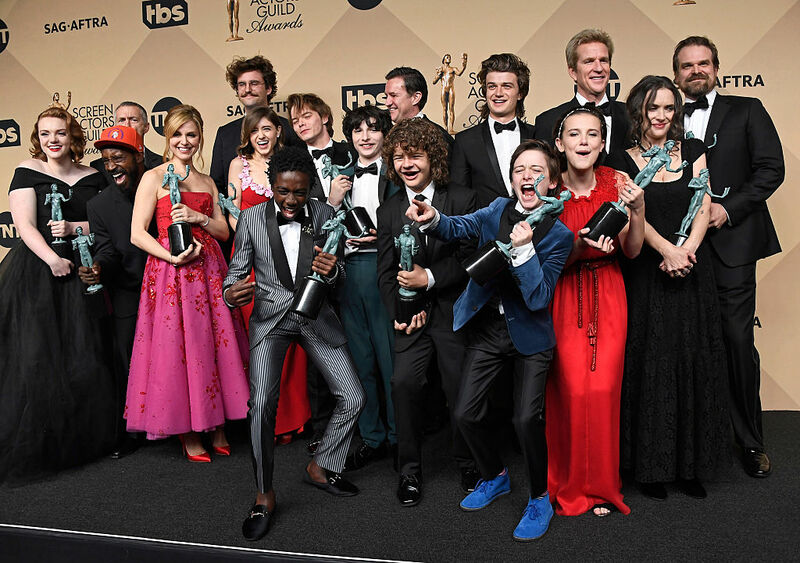 But Finn Wolfhard, Gaten Matarazzo, Caleb McLaughlin, and Noah Schnapp are actually in the "B tier" as far as compensation is concerned, with the show's adult cast members Winona Ryder and David Harbour making up the A tier, earning up to $350,000 per third season installment. Then there's the C tier: The show's lineup of older teens, Natalia Dyer, Charlie Heaton, and Joe Keery, who are said to be making about 150 grand per ep. If you're a fan of Stranger Things, or maybe if you have absorbed a working knowledge of the show's cast thanks to social media and Mad magazine satires, you probably noticed a conspicuously absent name from either of the above three payment tiers. That would be Millie Bobby Brown, who plays Eleven on the show, and whose management is being relatively secretive about her contract with Netflix. It is known that at the very least, she's making the same $250,000 an episode that the B tier is bringing home, but some sources have her earning as much as the A tier at $350,000, while still others are skeptical that a 14-year-old actress would be pulling in as much as the Oscar-nominated Ryder with three decades in the business. Those sources say Brown might be in a tier of her own, earning about $300,000 per episode. The main point, though, is that everybody in the Stranger Things cast is reaping the rewards of the show's huge pop cultural success. Once it became clear that Netflix had a phenomenon on their hands, the cast was reported to have gotten bonuses of about $60,000 each. But the new salaries take things to a new level: During the first two seasons of the show, the child actors in the cast were making about $20,000 per episode, while Harbour made about eighty grand, and Ryder was the sole name star with a salary of about $100,000 an episode.